ASPEN Reinforces the “Great Wall of Mangroves” with Bulacan’s Bantay Dagat | FEED, Inc.
01 December 2017, Pamarawan Island, Bulacan. Today marks ASPEN Philippines, Inc.’s 6th Planting with FEED. 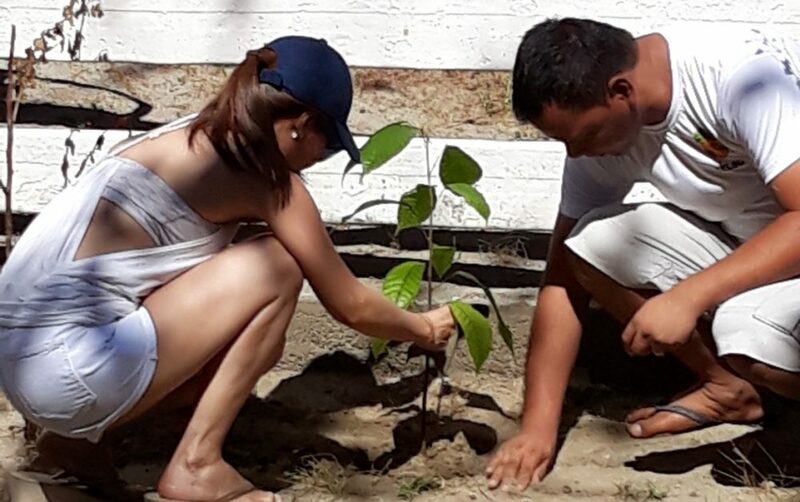 On the first of December 2017, ASPEN planted with FEED for the 6th time to date*, this time at the mangrove sanctuary in the coastal Barangay (Town of) Pamarawan, Bulacan, adding 2,500 mangrove seedlings to the ambitious “Great Wall of Mangroves” initiative conceived by the ABB-BP coastal alliance led by Malolos Mayor Honorable Christian Natividad – a staunch pioneer and supporter of environmental conservation efforts in Bulacan province. Hon. Mayor Natividad and Malolos City Administrator (CA) Atty. Rizaldy L. Mendoza were represented by Cora Castro from the City Government of Malolos, which was instrumental in providing the 5 banks (boat transport) and manpower; lunch and refreshments for the Bantay Dagat; security and safety personnel; and logistical support required for the whole crew to enable a smooth and successful tree-planting event. The local Bantay Dagat of Bulacan are the main, voluntary Protectors of the Mangroves and the provincial coastline. Aside from harvesting mangrove propagules, preparing saplings, bagging and nurturing seedlings for such continued plantings, the Bantay Dagat also help FEED and partners during such private sector engagements to prepare and maintain the sites planted. Due to their being full time fishermen, they are paid for the (transport of) seedlings used in plantings, as well as provided meals and beverages throughout the half day program. ASPEN Philippines volunteers didn’t just add 2,500 new trees to a mangrove sanctuary, they also gave livelihood to the local fisher folks who collect the seedlings, prepare and maintain the site and provide assurance of 100% survival of species; also providing a reliable alternative source of food for the coastal communities and nurseries for the different crustacean and fish species and nesting grounds for migrating birds. ASPEN Philippines’ continued drive to plant and reforest the Philippines plays a vital role in stabilising and protecting our villages and livelihood sources against flooding, pollution and erosion, fortifying the ecosystem restoration efforts of the entire province of Bulacan and surrounding areas. Despite the often excruciating conditions involved in planting, such as overexposure to temperatures above 30 degrees Celsius, heavy rains/winds, inland and coastal inundation, dehydration and pollution, it is thanks to companies like ASPEN Philippines and the well-meaning Bantay Dagat volunteers that more individuals, communities, government and private sector are becoming critically aware of the need to directly participate in action- and solution-oriented interventions. “Mangroves provide local fishermen a chance to improve their lives by rehabilitating their source of livelihood, said Daniel Sta. Ana, a fisherman and leader of the Bantay Dagat team that oversees the mangrove plantations along the rivers and Barangays Pamarawan, Caliligawan, Calero, Babatnin, Masili and Namayan. He said the mangroves had started to help clean up the marine environment and fish had repopulated the coastal waters. “Our mangrove sanctuary protects us from effects of global warming and climate change, or from tsunami,” he said. Among the daily catch of fishermen are “alimasag” (small crabs), “asuhos” (cod), tilapia and “bangus” (milkfish). Elmer Cruz, 37, said assorted fish such as “samaral,” “apahap,” “lapu lapu,” “kitang” and “kanduli” had already been harvested. “We did not catch as many fish before. But today, when everyone here takes care of the marine environment, our daily harvests have been bountiful and we are happy,” he said. The fishermen have taken the task of planting mangroves and have been monitoring the rivers and the coastlines of Manila Bay for signs of dynamite fishing. Fishing using dynamite or makeshift electrical rods harm fingerlings and mangrove roots, Sta. Ana said. The fishermen have also been coordinating with fishpond operators in nearby rivers in implementing a ban to artificial feeds that occasionally flow into the mangrove areas. Mayor Christian Natividad said the mangrove sanctuary occupies 38 hectares of Malolos coast. Mangroves grow better and safer along the Manila Bay coast than in the river, based on the records of Bantay Dagat. They grow fast between December and January and February, or during summer”. FEED is a UN Global Compact, Global Partnership for Business & Biodiversity, and Earth Charter Endorser signatory with the aim to ensure that its social forestry approach and collaboration with private, public, government and NGO sector further align us with the other global, regional and local initiatives to combat climate change, ensure water and food security, and build the country’s disaster and risk resilience for the benefit of all. Fisheries: Mangrove forests are home to a large variety of fish, crab, shrimp, and mollusk species. These fisheries form an essential source of food for thousands of coastal communities around the world. The forests also serve as nurseries for many fish species, including coral reef fish. A study on the Mesoamerican reef, for example, showed that there are as many as 25 times more fish of some species on reefs close to mangrove areas than in areas where mangroves have been cut down. This makes mangrove forests vitally important to coral reef and commercial fisheries as well. Timber and plant products: Mangrove wood is resistant to rot and insects, making it extremely valuable. Many coastal and indigenous communities rely on this wood for construction material as well as for fuel. These communities also collect medicinal plants from mangrove ecosystems and use mangrove leaves as animal fodder. Recently, the forests have also been commercially harvested for pulp, wood chip, and charcoal production. Coastal protection: The dense root systems of mangrove forests trap sediments flowing down rivers and off the land. This helps stabilizes the coastline and prevents erosion from waves and storms. In areas where mangroves have been cleared, coastal damage from hurricanes and typhoons is much more severe. By filtering out sediments, the forests also protect coral reefs and seagrass meadows from being smothered in sediment. Tourism: Given the diversity of life inhabiting mangrove systems, and their proximity in many cases to other tourist attractions such as coral reefs and sandy beaches, it is perhaps surprising that only a few countries have started to tap into the tourism potential of their mangrove forests. Places as diverse as Bonaire and offer snorkelling expeditions in and around mangroves to witness a marvellous variety of baby fish, jellyfish, and urchins against a magical background of interwoven roots delving deep into the sandy substrate. Great potential exists elsewhere for revenue generation in this manner, which values the mangroves intact and as they stand. Aspen Philippines Incorporated is one of the Group’s units in the Asia-Pacific market – a growing one at that. Furthermore, it is represented in South Africa, Australia, Hong Kong, Kenya, Nigeria, Tanzania, Uganda, Dubai, Germany, Ireland, Mauritius, Brazil, Malaysia, Mexico and Venezuela with 26 manufacturing facilities at 18 pharmaceutical manufacturing sites across 6 continents. Aspen Philippines Inc. started operating in January 2012 with only a handful of employees. But after a few months, it has rapidly increased to over 100 passionate Filipino staff. ASPEN Philippines has been planting with FEED since early 2017, this latest mangrove planting being the 6th one to date. ASPEN Philippines’ President & CEO, Marcelina “Ace” Itcheon was also named a FEED Ambassador in September 2017.